Motorola Solutions Federal Vertical is specialized in building radio communication products Government employees need. Puget Sound Instrument is a premier provider of the digital P25 ASTRO APX two-way radio system from Motorola. This systems is specifically designed to meet the requirements of the Federal Government, DOD, US Military and Embassies worldwide. Motorola Solutions radios conform to both Phase I and Phase II of the APCO P25 standard and are the most widely used P25 equipment. Rugged and reliable, the ASTRO APX P25 digital two-way radio communications solution is second to non, with more performance, productivity and value for your agents, soldiers and government employees. Additionally, Motorola Solutions leads in the professional digital radio market with their MOTOTRBO Offerings. The P25 base station, radio repeater, and console are core to your dispatch operations. 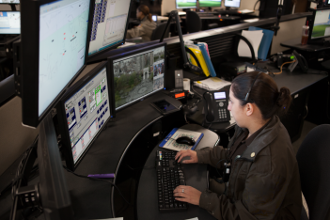 Motorola offers a variety of configurations to meet the needs of dispatch centers from a simple desktop dispatch to a large multi-position command and control console configuration. Motorola repeaters are 100% continuous duty with a very rugged design. Additionally, P25 offers numerous applications & features, including GPS, OTAP, OTAR, Single and Multisite trunking and Phase II TDMA support. Contact us about P25 infrastructure.